Honda CR-V Interior, Sat Nav, Dashboard | What Car? Few people will have any complaints about the fundamentals: the pedals, seat and steering wheel are all well aligned. There’s a good range of adjustment in the steering column for height and reach, and the driver’s seat offers manual height and electric lumbar adjustment. The lever for adjusting the backrest angle is annoying, though; it leaves you with a set number of positions, none of which ever seems to be ideal. Electrically adjustable seats are available to cure this, but you’ll have to fork out for the most expensive EX trim to get them. The CR-V has the same dashboard layout and digital instruments as the Honda Civic. The digital instruments can't be configured to your taste, though, like those of the C5 Aircross or 5008 can. You might want to stop the car and call in help from a member of Mensa before trying to change the information displayed, too – we drive different cars every day, yet spent an inordinate amount of time simply trying to reset the CR-V's trip computer. Then there’s the rest of the layout, such as the steering wheel buttons, of which some operate the cruise control. You might expect an ‘on/off’ button, right? Not in the CR-V. Oh no, here the challenge comes in working out that the small button labelled ‘Main’ is the one that turns the system on. Well, of course it would be. 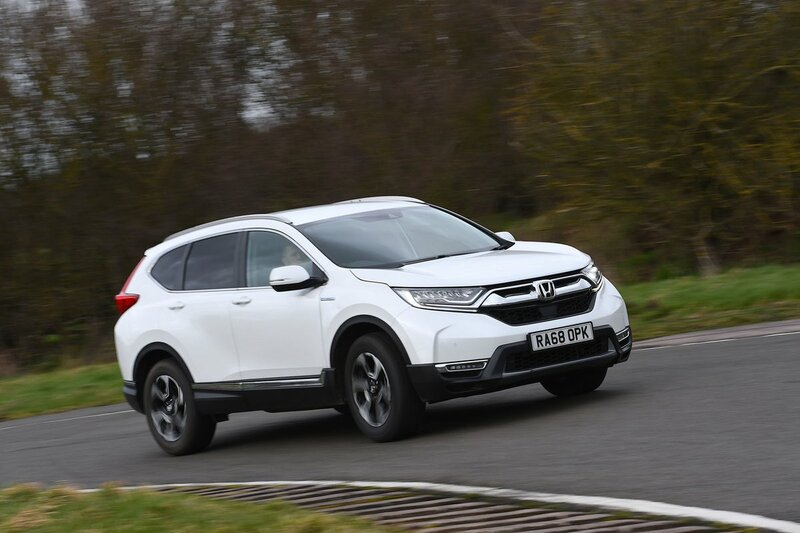 The CR-V's windscreen pillars are unusually slim for a large SUV, and visibility in bends is happily unrestricted. The deep front side windows and large door mirrors also make it easy to see out the sides. Then, if you crane your neck to look behind you, the tapering rear window line still leaves enough glass area for a clearer view when reversing than you'll find in plenty of its rivals. The rear window itself is quite small, though, so you’ll appreciate the front and rear parking sensors and reversing camera you get on SE models and above. Bright LED headlights, meanwhile, are standard throughout the range. Let’s not pull any punches here: the CR-V’s infotainment system is the same as the one in the cheaper Civic and it’s poor. By the standards of the large SUV class, which features cars that have brilliant systems such as BMW’s iDrive and Audi’s MMI, it’s even less competitive. So, what’s the problem? Well, the 7.0in touchscreen may be conveniently positioned on the dashboard, but it's disappointingly low in resolution. Worse still, the menus are complicated and the screen is often sluggish to respond. Mercifully, Apple CarPlay and Android Auto smartphone mirroring are standard from our recommended SE trim, so you can, in effect, bypass Honda's own operating system and use the touchscreen to control your phone's instead. 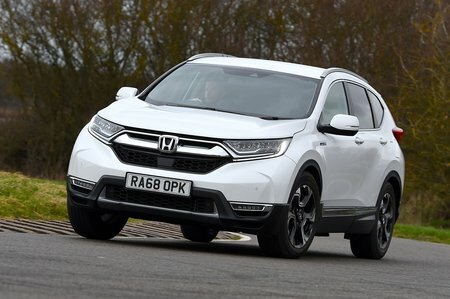 Compared with previous generations of the CR-V, the current model's interior received a substantial uplift in material quality. There are soft-touch plastics and a leather effect on the upper areas, stitched leather on the door trims, gloss black panels and silvery highlights that create an upmarket atmosphere. That said, the sheer number of materials used, including the fake wood veneers on some versions, make it feel like the stylists just couldn’t stop styling. VW Group rivals that include Volkswagen Tiguan and even the cheaper Skoda Kodiaq have more cohesive and appealing designs. It feels robust in the main, but even in this regard there are places — give the front door handle a firm pull and it flexes in your hand — where it's not quite on a par with the sturdiest and plushest of its rivals. The Mazda CX-5 knocks it for six when it comes to interior build.